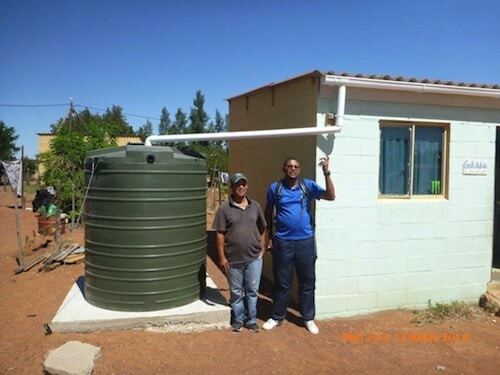 The Department of Water Affairs (DWA) appointed Casidra to implement the rainwater tanks for food production in the West Coast and Overberg regions. The Department of Water Affairs is the custodian of South Africa’s water and forestry resources. Its aim is to ensure the availability and supply of water on a national level, ensure equitable and efficient provision of water services at local level and promote sustainable forest management. Meanwhile striving to ensure that all South Africans gain access to clean water and safe sanitation, the water sector also promotes effective and efficient water resources’ management to ensure sustainable economic and social development. Casidra delivered approximately 160 rainwater tanks to the various beneficiaries, which includes households and schools. The cement concrete slabs, water plastic gutters, Nutec fascia boards, water taps, hosepipes and iron anchors were also delivered as part of the project. In the West Coast region, Casidra implemented 96 vertical water tanks (152×2500 litres) to areas such as Redelinghuys, Porterville, Aurora, Malmesbury and Moorreesburg, and 56 tanks were implemented in the Overberg region (Stanford, Elim, Bredasdorp, Struisbaai, Napier) and four schools received the 5000 litre water tanks. According to Casidra’s project manager, Michael Mackenzie, the local service providers were used to render the required services. He said, “This is part of job creation and empowerment of our entrepreneurs within the communities that we work with. It was good to see the smiles and happy faces of the beneficiaries when they signed the acceptance of assets”. Mackenzie was congratulated by the Department of Water Affairs, Casidra’s Chief Executive Officer and Chief Operations Officer for successfully completing the distribution of the rainwater tanks project. The service he rendered was rated excellent considering the timeframes which were given to execute the project. He went the extra mile by putting in more effort to achieve excellent results. Our new CEO, Michael Brinkhuis, echoed that this underlines our commitment for excellence. “You have made a difference in someone’s life”. Well done!